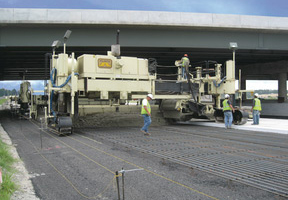 With a loan backed by an insurance policy from EXIM, Guntert & Zimmerman Construction, Inc. sold $1.4 million in concrete paving equipment to a Czech Republic company looking to expand its fleet of road construction machinery. The California-based small business was founded in 1942 as an engineering and construction company to fulfill World War II contracts. Today, the company has more than 50 employees and exports to a wide range of global markets including the Netherlands, Indonesia, India, the Czech Republic and Canada. EXIM supported $21.2 million of the company's export sales in the 2013 to 2018 period. "EXIM''s and [California-based] Bank of the West's support were instrumental in our being able to secure this deal. Central and Eastern Europe are very competitive markets, but the high quality of our equipment, the competitive U.S. dollar and this Ex-Im Bank-backed credit facility helped push the purchase in our favor. Right now our backlog is exports. If the backlog continues to grow, we will bring on more people. Currently, we're looking for another engineer and some machinist."